Kapustin wrote his Twenty-Four Preludes and Fugues op. 82 in 1997; he composed the Preludes first, and then used motifs from each to build the Fugues that follow. The whole work is by far his largest - 217 pages of music - and arguably his greatest in terms of breadth and scope of vision, the variety of musical styles he employs and his seemingly bottomless well of creativity. The unique key sequence helps to imbue each Prelude and Fugue with its own particular character when played as a set. Quite simply: a masterpiece. Gaylen asks: Is this the entire 24 preludes and fugues or just half (second volume)?? Is there a volume one? Sarah Rodgers answered:This volume contains numbers 13 - 24. 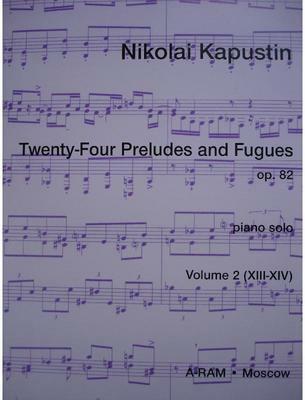 What do you want to know about 24 Preludes & Fugues op 82 vol 2 by Nikolai Kapustin?